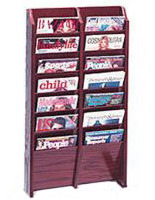 Dividers are Slanted to Make Publications Easy to Grab! 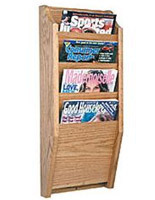 Store TONS of Promotional Materials! 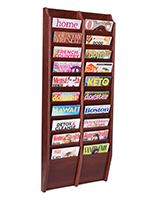 Mounts to a Wall, Freeing up Floor & Counter Space! 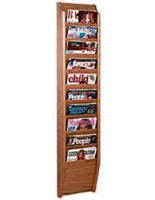 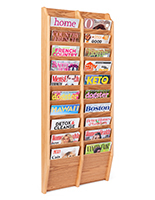 This hanging wooden 10-pocket publication rack for professional offices effectively stores promotional publications or related reading materials! 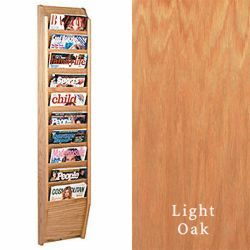 This literature displays system in light oak is sized for letter-sized catalogs and pamphlets. 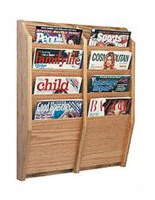 This hanging wooden 10-pocket publication rack, such as a magazine displays system, attract attention from visitors due to the good looking, sturdy presentation. 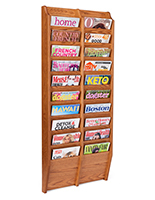 This mounted fixture frees up space on counters and floors for other business accessories. 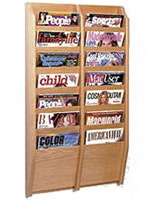 This publication rack that is a brochure display features ten dividers for dispensing information!